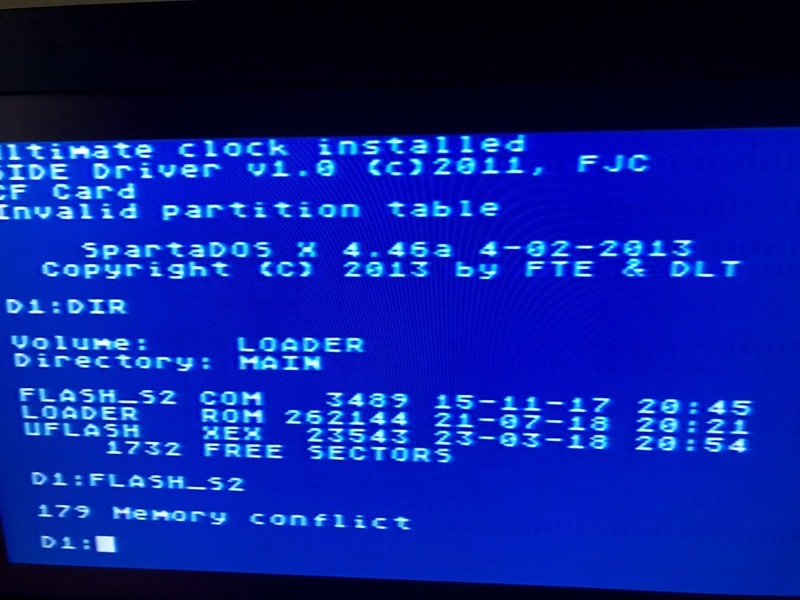 Hello, Ive been trying to update side2 to FJCs firmware, I managed to load the Flash útil executable using the menu loader.. If I switch the cart to sdx mode, it can detect the cart, but now I get an error enable extended memory and continue. Does this require a 130xe or expansion? . Im trying to do it in my 800XL. Edited by Mariano DM, Wed Apr 17, 2019 5:42 AM. I provided four ATRs in the 'ATR' folder of the firmware update. Run the 'FLASH_S2.COM' file on the 'side_loader.atr' image and the loader will be updated. You should first boot SDX from the cartridge itself before launching the flasher. It works on 64K machines. there are 4 ATR files in the ATR section. what is the diference between those 4 ? And what is the correct order to update the Side2 (Lotharek) cart ? SDX rom first, then SIDE loader ? The loaders for SIDE and SIDE2 are actually identical, but the SDX ROMs are not. Nevertheless I included separate loader ATRs for maximum clarity, supposedly. I'll include a README in the next update, nevertheless, since it's plainly needed and the purpose of the .COM flashers is obviously unclear. You can update things in any order you please, since SDX and the loader are two completely separate entities. Note: actually, the separate loader ATRs are required since the SDX banking register is used during the flashing process, and that differs between SIDE and SIDE2. Edited by flashjazzcat, Wed Apr 17, 2019 6:55 AM. I remember I used the Side2_full. 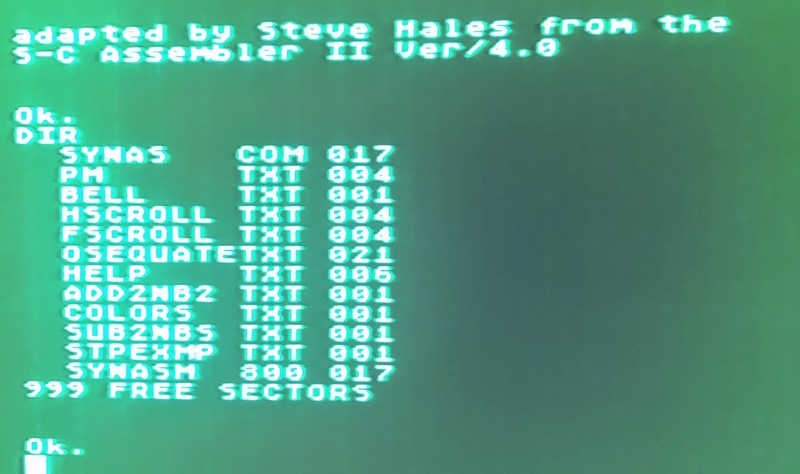 I first updated SDX then the Loader, as described in a relative YouTube video. FJC, if I want to replace the SIDE2 loader with something i program myselve but still want to have SDX on the SIDE2, do you have a seperate SDX Rom that I can use to only flash the newest SDX to the SIDE2 ? and is there also an option to use the full 512KB for SDX only ? The SDX ROMs for SIDE2 are all available directly from the SDX upgrade site, so I saw little point in offering them for download from my site. I could link to them in the future, I suppose. As for replacing the loader: you're free to flash whatever you like to the external cart ROM, and you can do so with either UFLASH or the DLT flasher. Later this week I'll be releasing SIDE ROMs which include the loader and all four OSS language carts (kindly converted by ebiguy). 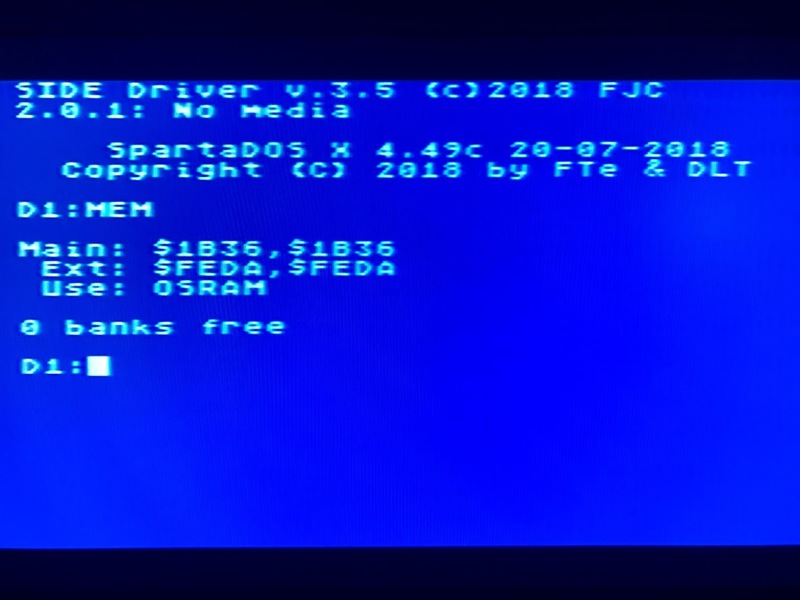 It should be possible to use a 512K SDX ROM, although it's difficult to imagine a scenario where this would be necessary since it's difficult to fill up the CAR: volume on the 320K builds available for U1MB. The 8K file size limitation does not help. But since the SDX banking register is - necessarily - able to access all sixty-four 8K banks of the ROM, there's no reason it could not be done. If I only use the side2 loader, I get a memory conflict error. I updated using the side2_full atr and now I get FJC's loader. Next: Trying to figure out how to create an APT partition in the CF without 128Kb. Edited by Mariano DM, Wed Apr 17, 2019 12:25 PM. Edited by _The Doctor__, Wed Apr 17, 2019 1:17 PM. The SIDE.SYS driver is pushing MEMLO up too high for the flasher. Try booting from an SIO-attched disk containing a CONFIG.SYS which doesn't install the SIDE driver, and you should be good. What am I saying? I thought of this already, of course. Boot as normal, but while holding down the shift key. SIDE.SYS won't load and you can run the flasher from your SIO-attached ATR. Edited by dimfil, Wed Apr 17, 2019 1:48 PM. Edited by Stormtrooper of Death, Wed Apr 17, 2019 2:32 PM. Thanks for all the guidance, I'll try both methods and publish my results. 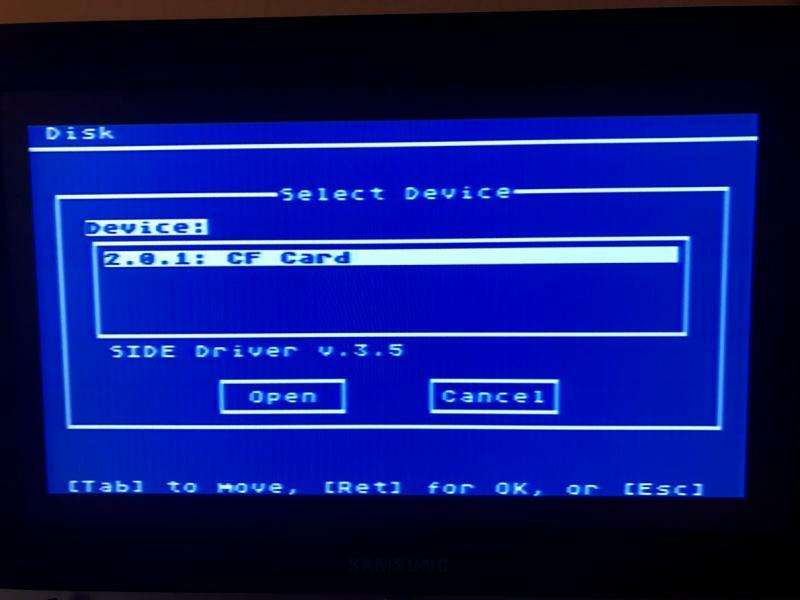 No, it is not detecting the card because of memory conflict issues with Side driver, as Jon explained in another thread when I asked the same question. The FDISK stub loader should check MEMLO and exit gracefully, but it makes little difference at the end of the day, since the SIDE driver pushes MEMLO too high on a 64K machine for most applications to even run. If you manage to get the disk partitioned, it's still not going to be much practical use, IMO. The solution is more RAM or U1MB (the latter making the SIDE.SYS driver totally unnecessary and ironically rendering the hard disk fully usable in 64K of RAM). Of course the SIDE loader is perfectly at home on a 64K machine, but SDX quickly starts feeling cramped without extended RAM regardless of whether one wants to use SIDE.SYS or not. I remember hurrying to upgrade to 128K in 1989 within weeks of purchasing my SDX cart. Take a look at this, using the custom config, it actually worked. Mariano, did you use my custom Config file ? If it works on a real SIDE2, then that is great news for 64K Atari users. What is the resulting MEMLO with this configuration (type 'MEM')? Here's mem results. 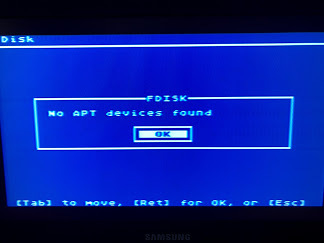 I think the custom config made barely enough for fdisk to work. As expected, things like Turbobasic still get memory conflict, but synasm loads fine.